In this article, we have prepared few questions out of various previously asked questions in several recruitment exams. Such questions will prove effective to the aspirants. So, take it placidly. Our devoted SSC team of Jagranjosh.com has framed a set of 25 questions taken from the diverse previous examinations i.e. IBPS, RBI, SSC and other exams. At the time of handling these questions, Set time frame in mind for getting skilled in these examinations, especially. As quantitative section requires the following attributes from you. - Accelerated perception of Questions. - Superior understanding of observing questions in terms of formulas. - Diverse and alternative tricks to simplify questions and etc. Directions (Q. Nos. 1 to 5): What approximate value should come in place of the question mark (?) in the following questions? 1. 12959.998 ÷ 18.010 = ? 3. 6894.986 + 5025.005 + 600.020 = ? 4. 31.999 × 12.001 × 17.5001 = ? 6. Mrudul invested an amount of Rs. 29500 in order to start a business. Shalaka joined her 4 months later by investing an amount of Rs. 33500. If the business earned a profit of Rs. 120575 at the end of two years, what was Mrudul’s share of the profit? 7. What is the least number that can be added to the number 1020 to make it a perfect square? 8. Philip, Tom and Brad start jogging around a circular field and complete a single round in 18,22 and 30 seconds respectively. In how much time, will they meet again at the starting point? 9. A water tank has three taps A, B and C. Tap A, when opened, can fill the water tank alone in 4 hours. Tap B, when opened, can fill the water tank alone in 6 hours and tap C, when opened, can empty the water tank alone in 3 hours. If taps A, B and C are opened simultaneously, how long will it take to fill the tank completely? 10. What total amount would Mithilesh get at the end of three years if he invests an amount of Rs. 11200 in a scheme, which offers simple interest 8.5% per annum for three years? Directions (Q. Nos. 11 to 15): What should come in place of the question mark (?) in the following questions? 11. 1111.1 + 111.11 + 11.111 = ? 14. 8080 ÷ 80 ÷ 8 = ? 15. 25% of 84 × 24% of 85 = ? 16. Prasad sold his work tools for Rs. 1850 and earned a profit of 25 per cent. At what price did Prasad buy the work tools? 17. What would be the cost of building a fence around a school at the rate of Rs. 34 per foot? Directions (Q. Nos. 18 to 22): Study the following graph carefully to answer the questions. 19. 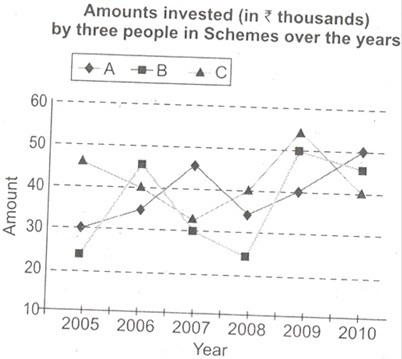 What is the per cent decrease in the amount invested by C in the year 2007 from the previous year? 20. What is the respective ratio of total amount invested by B in the years 2003 and 2010 together to the total amount invested by C in those two years together? 21. The amount invested by A in the year 2006 is approximately what per cent of the total amount invested by him over all the years together? 22. What was the total amount invested by all the three people together in the year 2005? Directions (Q. Nos. 23 to 25): Study the information given below and answer the questions that follow. A building consists of men and women who spend their leisure time in watching movies, learning dance and learning singing. 8 men, who form ten per cent of the total number of men in the building, learn to dance. The total number of men in the building, learn to dance. The total number of women in the building is 62.5 per cent of the total number of men in the building. Twenty-four per cent of the total number of women learns to sing. One-fifth of the total number of women watches movies. The ratio of the number of men watching movies to the number of women doing the same is 13:2 respectively. 23. What is the respective ratio of the number of men learning dance to the number of women doing the same? 24. The total number of women in the building is approximately what per cent of the total number of members (men and women together) in the building? 25. What is the number of women learning dance?